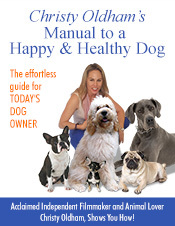 "How to Have a Healthy Dog!" Our pet sitting and dog walking service caters to busy professionals, elderly people, holiday travelers and those who have last minute business trips or vacation getaways. Our goal is to provide personalized attention, quality care and reliable service for your pet in the comfort of your own home while you are away. Our caregivers are efficient, loving and are insured for your peace of mind. Dogs Love Christy's New Book! 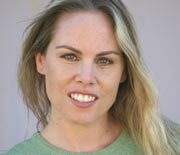 Award winning independent filmmaker and Animal activist Christy Oldham, is the owner of Healthy Dogs. Before migrating to Los Angeles in 1998 from her native state of south Louisiana, Christy studied Veterianarian science and theatre at N.S.U. and L.S.U. 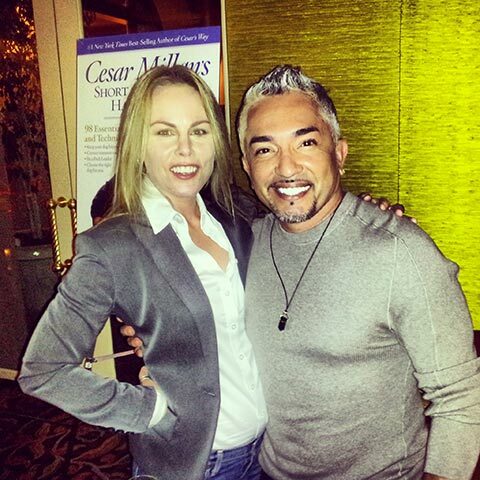 She is a proud supporter of animal rescue and has over 10 years volunteer experience.
" It came to my attention that a lot of my filmmaking colleagues were unhappy about leaving their pets at kennels when they were on location or on set for an extended time. They were distracted and some even felt guilty. So, I decided to create a service that was less stressful for the animals and that took the worry out of pet owners." Christy handpicked quality, professional caregivers who are available to serve pet owners in the SFV, Hollywood, Beverly hills, West Hollywood, Brentwood, Culver City, Beachwood Canyon, Silverlake, Burbank, Glendale, and North Hollywood areas. All pet sitters have animal care and volunteer experience, are trustworthy and dependable, have been screened for their background and most are pet owners themselves! Every pet is unique and every household different, so please don't hesitate to tell us about your special needs and work hours. 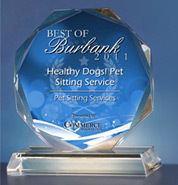 'Best of Burbank' Award for Healthy Dogs! Petcare Owner -The U.S. Commerce Association (USCA) presented Christy Oldham, CEO of Healthy Dogs! Petsitting Service, the prestigious 'Best of Burbank 2011' award for excellence in customer (and pets) satisfaction. Now celebrating 5 years in business, Healthy Dogs! To learn more about our professional and licensed dog walking and pet sitting services email us today.